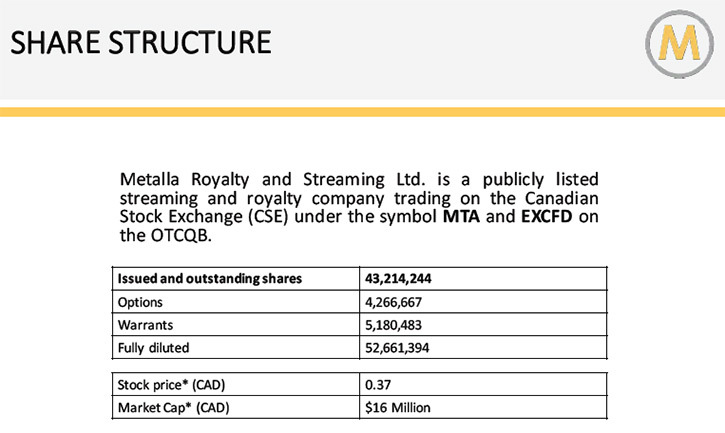 Metalla Royalty and Streaming Ltd. (CSE:MTA; OTC:EXCFD; FRANKFURT:X9CP) (formerly Excalibur Resources) is a new precious metals royalty and streaming company engaged in the acquisition and management of precious metal royalties, streams and similar production based interests. 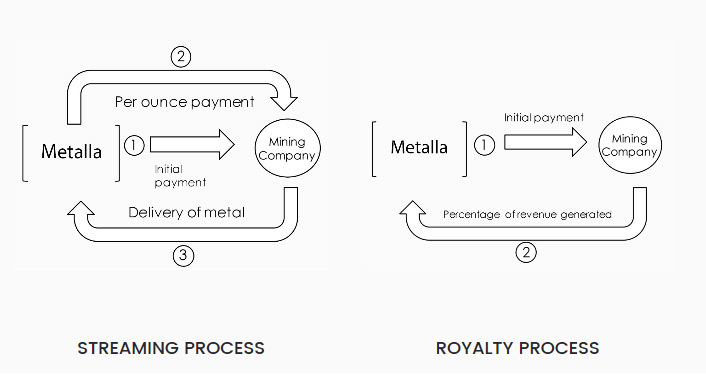 According to Brett Heath, President of Metalla Royalty and Streaming, in regards to precious metal-related investments, royalty companies have consistently outperformed the rest of the market. The main projects include a 1% NSR on Goldcorp’s Hoyle Pond Extension properties, a 1.5% NSR on the West Timmins extension properties, owned by Tahoe Resources, a 1.5% NSR on the DeSantis properties, owned by Osisko Mining, and royalties on the Mirado Gold Project owned by Orefinders. Dr. Allen Alper:	This is Dr. Allen Alper, Editor-in-chief of Metals News, interviewing Brett Heath, President of Metalla Royalty and Streaming Ltd. Could you tell me a little bit about your company, what it does, how it differentiates itself from other companies in the mining business? Brett Heath:	Of course. Thanks for having me on metalnews.com. We're a new streaming and royalty company that was formed in September of 2016. Our goal is to build this company for the next bull market in the precious metals. Throughout the bull and bear cycles over the last decade, if not longer, royalty companies like Royal Gold, Silver Wheaton, and Franco-Nevada have had the best structure and the best returns across the board in regards to investing in precious metals or precious metal-related investments. They've consistently outperformed the rest of the market. We're focusing on a part of the market that is underserved. Underserved in the market are transactions, $2 - $10 million in deal size. Because of the success of the larger companies, they have continued to increase the size of their investments in order to make an impact on their cash flow profile. This has really opened up a lot of opportunity with much higher internal rates of return for us at the smaller level. Dr. Allen Alper:	That sounds very good. Could you elaborate on how the process works? Brett Heath:	Yes. Royalty and streams are basically the same. There are two major differences between royalties and streams. When you own a royalty, you own an interest in that mine. If I own a 1% royalty on XYZ Mining's producing operation, then I get 1% of whatever they produce. If they're a gold producer, I get 1% of the gold. If it's a gold and copper producer, then I also have gold and copper exposure. That's really where streams come in. Streams can give you exposure only to the byproduct, so in regards to a base metal company with a precious metals byproduct, it allows the company to go in directly, and also tax-efficiently, extract that metal for the shareholders. Really, the overall big picture for what we're trying to accomplish is we want to own a lot of these interests in a diversified group of very strong counterparty producers that will provide leverage and diversification for shareholders. Dr. Allen Alper:	That's very good. Could you tell me a little bit about how you compare to other royalty and streaming companies? Brett Heath:	Yeah, of course. 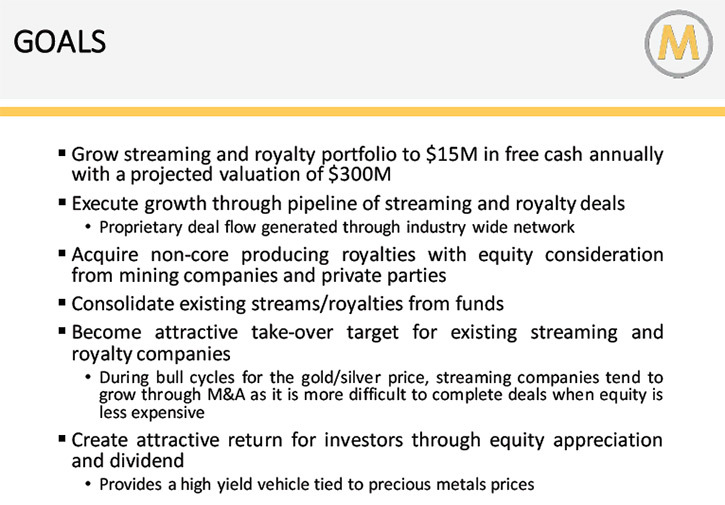 Right now there are about nine precious metal- focused royalty and streaming companies. There are three majors, multi-billion dollar companies, Franco-Nevada, Silver Wheaton, and Royal Gold. There are two mid-tiers, Osisko Gold Royalties and Sandstorm Gold, which are around a billion market cap. 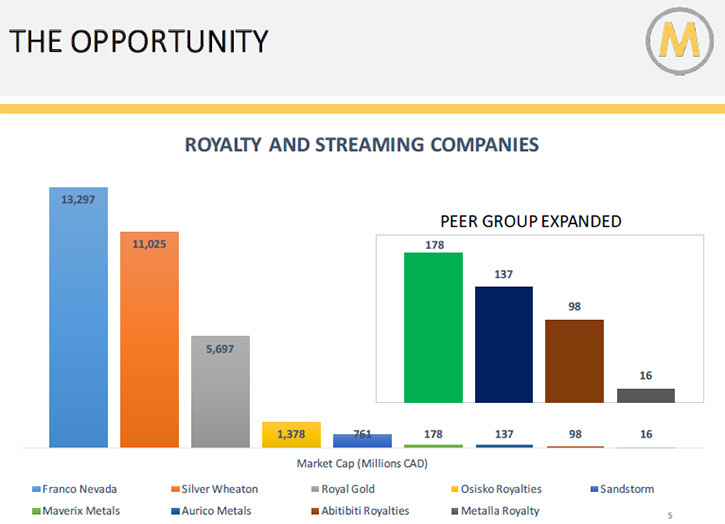 Our peer group, the new, smaller royalty and streaming companies include Maverix Metals, AuRico Metals, Abitibi Royalties, and our company Metalla Royalty. The difference is that Maverix, AuRico, and Abitibi were all a function of a spinout or an M&A transaction. Investors never really had the opportunity to buy these companies at valuations where they got started, usually it is restricted to insiders. Currently, they are valued between 100-200 million dollars in market cap. We are, at today's price of .40 cents, about a 17 million dollar market cap. What you have is a new recently formed company, which is going to give the aggressive early-on investors, the opportunity to own a streaming and royalty company at a ground floor valuation. One of my favorite examples for investors is Franco-Nevada, which back in 1985 started at around 30 cents, the same price we first offered shares to investors of Metalla. By the time they sold the company to Newmont a little more than a decade ago, it was a 1250 bagger for them, and that was just on the first time. Dr. Allen Alper:	By the way, I did a featured article on Silver Wheaton, and I've done many featured articles on Abitibi Royalties. Brett Heath:	Yes. Again, successful companies. Silver Wheaton in my opinion, is the biggest pure streaming company in the world, and you might say Franco is the biggest royalty company in the world, in regards to precious metals. Dr. Allen Alper:	Yes. Could you tell me a bit about some of the projects in which you're involved? Brett Heath:	Yes. We just recently closed one transaction. This transaction was to acquire a portfolio of royalties in Timmins. 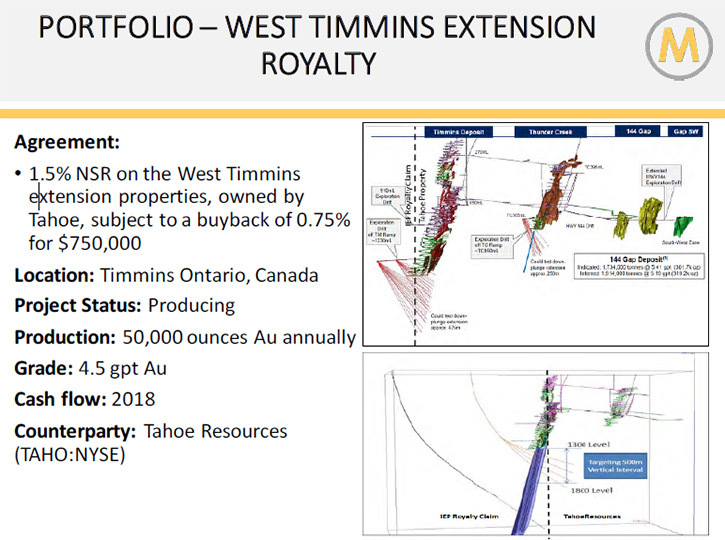 We acquired these royalties from a private company that has actually been up there for more than 50 years, and two of these royalties that we acquired out of the package are on mines that are operated by Goldcorp and Tahoe Resources. Both of these royalties are similar in nature, where we acquired a royalty on the extension of the current operating mine, the deposit that extends onto the property next door, ahead of time, and we were able to do that at a very attractive price. 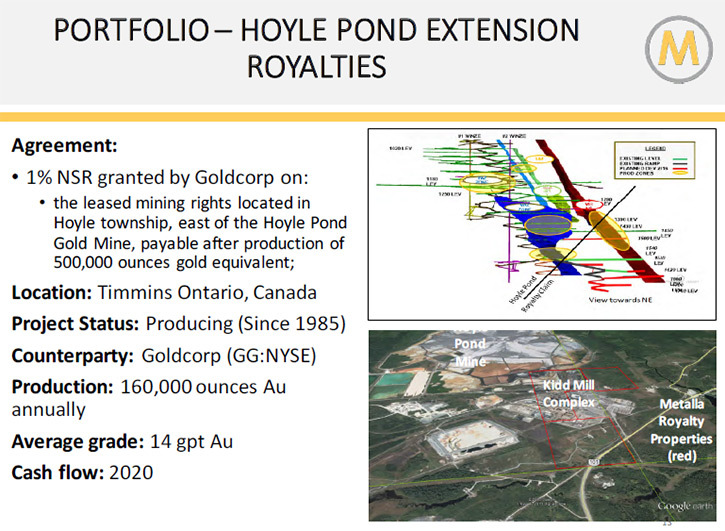 The Hoyle Pond, for example, currently produces 160,000 ounces of gold a year, and on the extension, we are going to have a 1% royalty on that. Currently, as of the 2015 Goldcorp annual report, the Hoyle Pond average grade is about a little over 14 grams per ton, so one of Goldcorp's higher margin, higher grade assets. It has been in production since 1985, and you have Goldcorp spending 194 million on the Deep Hole project that they completed last spring to access these levels on the extension, along with drilling, as of today, over 80,000 meters on this extension. They've invested quite a bit of money into this, and we will get paid 1% once they start mining. There is a 500,000 ounce exemption, so we're expecting this to cash flow some time in 2020, 2021, but we will have the firm numbers on that once we have the annual report come quarter one of next year. Dr. Allen Alper:	That sounds very good, excellent. Brett Heath:	I can touch on that second high profile project that we just acquired, as well. That was on the Timmins West deposit, also up in Timmins, Ontario. That mine is owned and operated by Tahoe Resources, which was previously Lakeshore Gold. We also, on this mine, acquired a royalty on the extension property. Once they start mining on the extension, which is just an extension of the initial deposit at depth, we will get paid on that as well. That one, has no exemption, and will cash flow sooner. Dr. Allen Alper:	That sounds excellent. Could you tell me a little bit about your background and the team? Brett Heath:	Yes. I've been involved in streaming and royalty companies for the last four years. I've done it publicly. I've done it privately. I've worked with other public companies. I've also done deals with private equity firms. 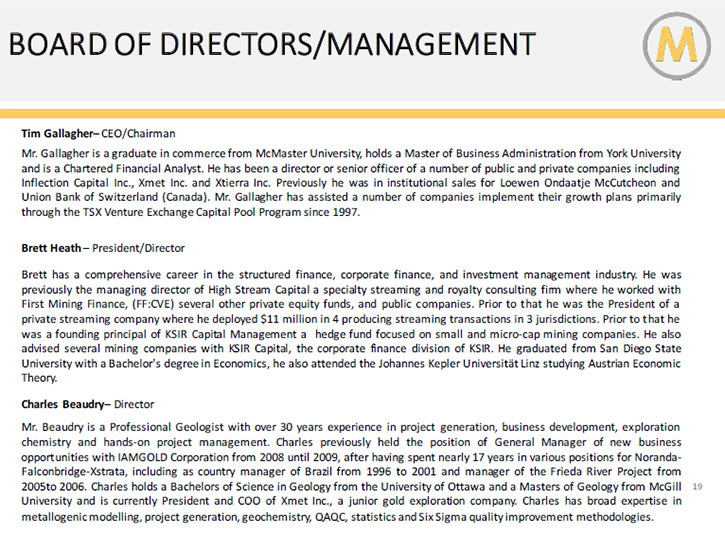 Prior to that, I ran a hedge fund that was focused on development and junior producing companies, and I was able to build relationships with a lot of management teams in the mining sector, this space that we're focused on specifically in regards to future deal flow. That has been key in building out our current pipeline and the transactions that we've been working on in the past and currently. Charles Beaudry, has 30 years experience as our technical geologist. Tim Gallagher, who's the chairman of the company, also has about 20+ years of capital markets experience. We're going to add board members aggressively to make us stronger, also management. We're an early company as of right now, but we’re adding the right personnel aggressively to build this company for the future. Dr. Allen Alper:	That's very good. Could you tell me what your goals are? Brett Heath:	Yes. Our overall goal is to create the best vehicle to invest in for precious metals exposure for this next bull cycle. We're going to do this by acquiring a portfolio of royalties and streams. The reason you want to own streaming and royalty companies at the beginning of a cycle is because you get what I call three times leverage. The first part of the leverage is the internal company growth. That means every time we execute a transaction and create free cash flow from these royalties and streams, we're going to get revalued in the market comparable to these other companies. The second part of the leverage is an appreciating gold and silver price. When we do these deals, we model them at today's prices. Often times, when you have a rising metal environment, these cash flows can sometimes double and even triple with just a modest rise in the metal price. The third bit of leverage that goes with that is the expansion of the multiples. 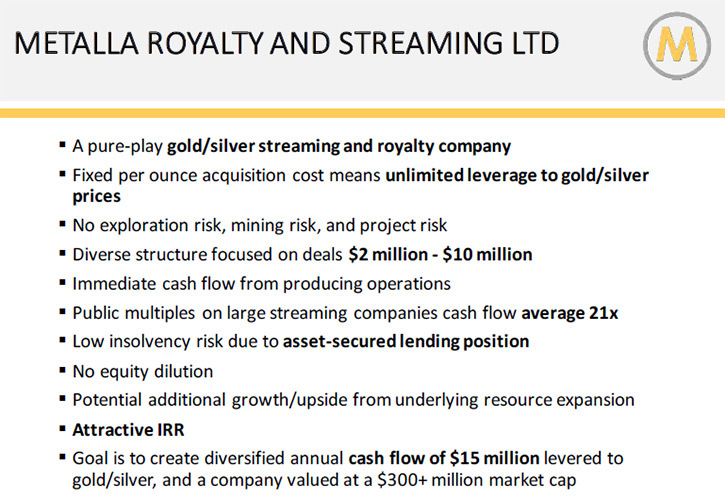 The royalty and streaming companies trade based on multiples of cash flow, with the bigger companies, Royal Gold, Franco, and Silver Wheaton trade between 20 and sometimes up to 40 times cash flow in bull markets. If you can create a company that has internal growth by additional transactions, a rising cash flow from rising metal prices, and rising multiples on how they are valued, this is what makes huge winners. That’s the reason these companies have been so successful over the last decade or so. Dr. Allen Alper:	That's very good. Could you elaborate a bit more on your share and capital structure and where you're listed? Brett Heath:	Yes. We are listed currently on the CSE, which is the Canadian Stock Exchange, under the symbol MTA, and we're also listed on the OTCQB, which is the OTC quality bulletin board, under the symbol EXCFD. Currently, we have approximately 43.2 million shares outstanding. Dr. Allen Alper:	Very good. What are the primary reasons our high-net-worth readers/investors should consider investing in your company? Brett Heath:	The primary reasons this is such an incredible opportunity is because you have the option, at today's valuations, to invest in a new royalty and streaming company where typically only the insiders had the opportunity in the past, with the other royalty and streaming companies that are available. The second reason is because it's by far the best structure and model to own precious metals or exposure to precious metals. The reason is because you own the metals in the ground, you get the exploration upside, you get the expansion opportunities, and you also get potential M and A opportunities, so there are a number of benefits to owning the diversified interests in many different mining operations in this type of company. That, from a risk-adjusted profile, is much, much more attractive than looking at exploration companies, looking at the junior producers that have a tough time making money at these prices, but then also the majors that really don't have that much upside. It's owning a micro-cap company with the risk profile of a much, much more established company. Our counterparts are operating these mines, like Goldcorp and Tahoe. Dr. Allen Alper:	Sounds like very good reasons our high-net-worth readers/investors should look at your company closely for investment. Is there anything you'd like to add, Heath? Brett Heath:	Yeah. If any of your readers would like more details on the company, our website shows quite a bit of information, and has an updated presentation. You can also reach out to myself or Tim Gallagher.